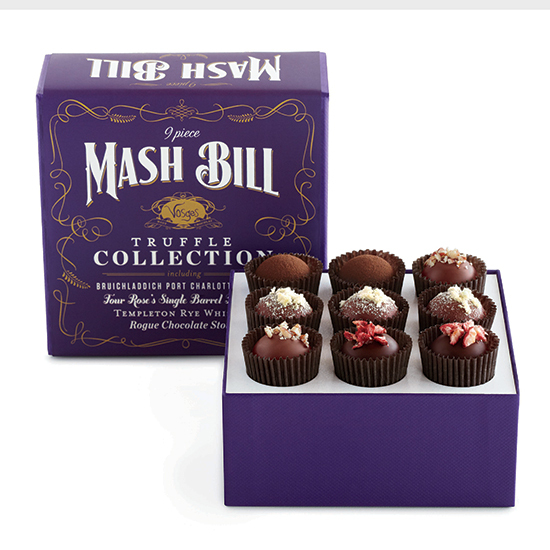 Liquor-filled chocolates are a great idea, but too often they taste like sweet, waxy cough syrup. Thankfully, top chocolatiers are making boozy bonbons that are delicious, based on a template of delicious chocolate with a hit of quality spirit. The royal family’s chocolate company of choice makes a truffle take on a gin and lemon fizz cocktail. It’s gin-lemon-and-juniper-berry-infused dark chocolate ganache covered in white chocolate. £12 (about $18). A whiskey and stout lover’s chocolate dream, this collection includes a coconut-and-cocoa-nib caramel infused with Bruichladdich Port Charlotte Scotch, a Templeton rye-infused cherry-and-tobacco dark chocolate truffle, a Four Rose’s-infused milk-chocolate-and-toasted-pecan truffle and a dark chocolate truffle infused with Rogue’s chocolate stout. $40. Pastry genius François Payard may be known for his ethereal macarons, but his truffles are equally sublime. His vanilla rum truffles are made with creamy dark chocolate flavored with rum and vanilla, encased in a thin, crunchy, cocoa-dusted shell. $45. Chocolatier extraordinaire Jacques Torres’s adorable cork-shaped Champagne truffles are filled with a mix of milk chocolate, cream and Taittinger Brut La Française for a caramelly, Champagne-forward flavor. $48. With creative flavors like olive oil-basil and PB&J, it’s no surprise that this New York chocolatier makes a sake truffle. Infused with Awarmori, a unique sake made only in Okinawa with long-grain Thai rice, the dark chocolate truffle is dusted with indigo sparkles. $29. Fika, a New York City-based Swedish-style coffee and chocolate shop, sells a six-piece set of manly, pitch-black truffles, which includes a Laphroaig whisky truffle, a Cognac truffle and a rum truffle. $11. Related: Best Chocolate in the U.S.